Whether it’s fair or not, the rise of Hammer Films will always be synonymous with the various revivals the studio trotted out during its heyday. The shadows of Dracula, Frankenstein, and The Mummy have always loomed large, creating the impression that Hammer was content to simply retrace Universal’s steps on their way to genre immortality. It is, of course, a preposterous and reductive reading since the stalwart British outfit churned out plenty of original films alongside those old staples, many of which went on to define the country’s genre output. Without Hammer, it’s difficult to imagine the British occult scene flourishing as it did, and films like The Witches were instrumental, even if this particular effort was hardly revolutionary. Like with so many Hammer efforts, it thrives on a sense of familiarity: you have a sleepy British town where the locals are an unsettling hive mind, whispers of witchcraft, plus poor Joan Fonatine being gaslighted yet again—it goes without saying that you’ve seen something like this before, even if it’s more of a Hammer “original” rather than a cover. Its prologue even drudges up the stuff of ghastly colonial horror, as Fontaine’s Gwen Mayfield begins her journey in Africa, where her stint as a schoolteacher comes to an abrupt end at the hands of a witch doctor rebellion. Some months pass when she re-emerges in Haddaby, a quaint village in need of a new teacher. At the behest of Reverend Alan Bax (Alec McCowen), she takes the position, even if the is still shaken from her previous experience. Red flags emerge immediately when this reverend doesn’t actually live in a traditional rectory, nor is there even a church; rather there are only ruins of the old place. Having to look past these discrepancies merely inspires more suspicion about a pair of students—Ronnie Dowsett and Linda Rigg (Martin Stephens & Ingrid Boulting)—who are unusually close, if not practically inseparable. This might not be so odd (teenage hormones are teenage hormones, after all) if the entire town weren’t so adamant that they should be kept apart; I mean, there are abstinence advocates and then there’s this bunch, which seems to think this relationship spells certain doom. Something is afoot in Haddaby, and, to its credit, Nigel Kneale’s script (adapted from Norah Lofts’s novel, The Devil’s Own) does its past to spin a curious yarn. Due to her experience in Africa, Gwen is quick to leap to witchcraft, and, instead of being completely laughed off, she finds a sympathetic ear in Bax’s sister Stephanie (Kay Walsh), a journalist eager to uncover a story that might be lurking just beneath her nose. While everyone else does dismiss these suspicions, it’s nice to see a script treat its audience with a little bit of respect: the paranoid crusader seeking truth against a monolith of disbelief would have already been well-worn by this point, so The Witches does its best to throw a few wrinkles into the dynamic by directly confirming its heroes suspicions outright. Viewers might be disappointed by the lack of incident in doing so, however. Most of the first half of the film revolves around Ronnie and Linda’s relationship, particularly how the latter’s grandmother (Gwen Ffrangcon-Davies) disapproves and will seemingly do anything to break them up. All signs—and especially Stephanie’s accusatory finger—point to Granny Rigg practicing witchcraft, leaving Gwen and the audience to sift through episodes involving voodoo dolls and mysterious illnesses. Ffrangcon-Davies makes for an interesting suspect during this stretch, at least, and Cyril Frankel’s otherwise workmanlike direction has some occasional inspired bursts, such as some evocative shots of a beach peppered with footprints from an alleged coven. For the most part, though, it all operates like clockwork—perhaps too much so, as barreling ahead into this most obvious direction results in Gwen ramming face-first into a dead end. About halfway through the movie, The Witches effectively resets itself with a convenient amnesia plot that finds Gwen having to work her way back into Haddaby, where she has to uncover the actual truth this time. Despite the film’s best efforts, it only pulls viewers back to yet another obvious direction: it turns out that overly accommodating and doting characters are actually menacing. Something awful begins to seep from behind the veneer of this quaint village, revealing a scene so familiar that Edgar Wright and Simon Pegg would eventually satirize it in Hot Fuzz. But this variation on the theme isn’t without its charms, at least. Frankel devotes most of the climax to a rapturous, nearly wordless cult ritual that finds almost the entirety of the cast writhing and dancing in delirium. The eventual coven leader (whose identity will be withheld here, but, come on) goes nuts for a good ten minutes or so, threatening to carve up all of the scenery with a mystical dagger—well, as soon as she’s done sacrificing the virgin draped across the mantle in the center of the proceedings. While The Witches takes a deliberate, roundabout path the come back to the exact spot we expected it to all along, it’s nice that it at least works itself up to a nicely frenzied climax. In some ways, it’s a bit of a sun-splashed precursor to The Devil Rides Out, which endures as the studio’s definitive take on this sort of material. Where that film thrives on a sinister, evocative urgency, this one lurches to the tune of a predictable inevitability. You can more or less set your watch by its twists and turns despite the script’s best efforts to throw you off the scent. Fontaine’s presence does lend a nice sense of prestige, though, and I’ll never completely dismiss this particularly bewitching strain of British folk horror. The Witches originally arrived on DVD way back in 2000, as one of Anchor Bay’s very first offerings in its legendary Hammer Collection. Since then, it’s pretty much receded to the background as the studio’s more prominent shadows obscured it. Leave it to Scream Factory to rescue it now that the label has turned its attention towards the Hammer library. Joining Plague of the Zombies, Dracula: Prince of Darkness, and Vengeance of She, The Witches makes its Blu-ray debut with a nicely restored transfer that ensures the film pops in all of its gorgeous, technicolor glory. For supplements, Scream has provided a newly recorded commentary with filmmaker Constantine Nasr and author/filmmaker Ted Newsom; they’ve also ported over “Hammer Glamour,” a 45-minute documentary devoted to the studio’s iconic women. Originally a part of Millennium’s Frankenstein Created Woman Blu-ray, it features anecdotes and tributes to the likes of Valerie Leon, Caroline Munro, Martine Beswicke, Madeleine Smith, Vera Day, and Jenny Hanley. 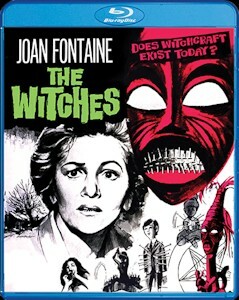 Even though it’s a holdover that isn’t explicitly dedicated to The Witches, it’s a nice introduction for the uninitiated looking to dig deeper into Hammer’s history. A theatrical trailer, a still gallery, and a reversible cover (featuring the film’s U.S. title, The Devil’s Own) round out another solid release from Scream Factory. With more Hammer offerings in the pipeline (Legend of the 7 Golden Vampires was released this past week, plus The Reptile is due later this year), Scream continues to be one of the most vital home video labels. What’s most exciting is that they’re mostly opting for Hammer deep cuts, thus giving modern audiences a chance to appreciate the full breadth and width of the studio’s output. Something like The Witches might not be as iconic as those franchise efforts, but it’s a crucial piece of the Hammer puzzle nonetheless.